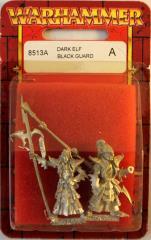 The Black Guard are the personal bodyguard or Malekith himself, the soldiery of the Dark Elf capital Naggarond. They are the fiercest fighters in all the land of chill. They owe loyalty only to the Witch King as many a Dark Elf Noble has found when the Guard have judged them to be at fault.